What reading/learning did I do this month? Learned InDesign and some new Lightroom tricks via Lynda.com I also finished up Book 2 and 3 from the Game of Thrones series. I started Book 4. What entertainment did I watch/listen to this month? Carol and I saw Mumford and Sons at the Jazz Aspen Snowmass festival over Labor Day. Awesome! I also added 3 new songs to my running playlist, “No Church in the Wild”by Kanye West and Jay-Z, “Love is Blindness” U2 cover by Jack White and that super catchy Korean pop song that went viral on YouTube, “Gangam Style” by PSY. After living in Korea for a year and a half, and then spending a year with them in Iraq, I just LOVE Koreans. And this video is just awesome. My TV shows came back this month too: Dexter, Revenge, Homeland…. But I’ll probably catch up mostly via OnDemand or on the internet or from the DVR. And of course football. We spent Labor Day in Aspen. So Pretty. JJ and I went to France. Awesome. What gifts did I give and/or receive? I gave Miles a ridiculously loud toy for his birthday. Seriously? What was I thinking?? JJ gave him HungryHungryHippos. What special or unusual purchases did I make? How did I do on my goals for the month? Eeek. I don’t think I did so well. This is embarassing! I accomplished 2 goals this month. I definitely wrote more than 3x a week, some became blog posts, but most did not. And I got together with friends a few times. I did 4/9 strength workouts; 4/6 yoga classes; Ran 17/40 miles; I did not finish either quilts (but I’m close!) and I took a photo every day but one. Anything else noteworthy to include? Congrats on your wedding!! And great shots throughout the month! 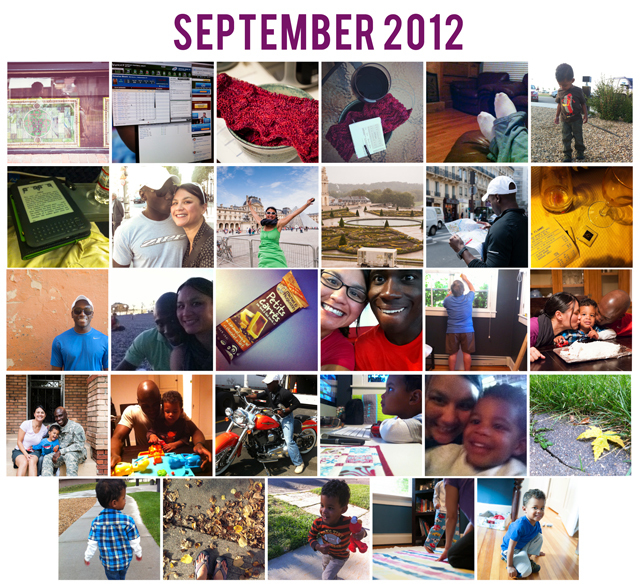 Very nice collage, and I love your idea of a monthly round-up!